Fall is finally here. Crisp air, cool weather, and the beautiful colors of fall foliage are all very much welcomed after months of hot weather. It’s the perfect time of the year to get back outside and enjoy nature. We aren’t the only ones that love this break from summer. Whether they are rolling around in the leaves, taking a midday nap in a warm sunlit area of the backyard, or strolling along beside the dog walker, our pets love to be outside during the Fall. It’s important to remember the hidden dangers that come with this time of the year, though. 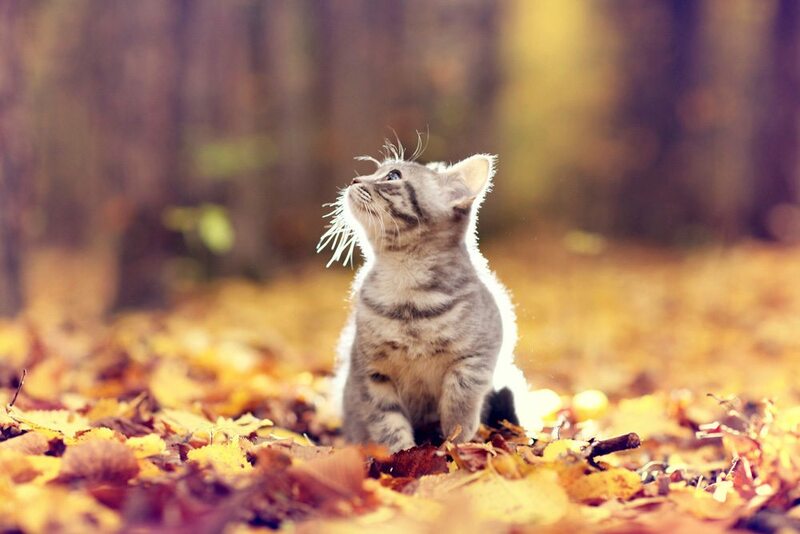 Take a look at these tips to help your pet stay happy and healthy during the fall festivities. Some of us notice that when the weather changes, we start getting the sniffles. Fall allergies are very common for us, but did you know that your pet can be affected by allergens as well? Be sure to watch your pet after they’ve come in from a romp in the leaves to see if they are itching more than normal. They could quite possibly be suffering from allergies. To eliminate any irritation to your pet’s skin, keep the grass cut and leaves raked in piles or put away in bags and always talk to your vet if you notice anything out of the ordinary going on with your pet. One common misconception about pests is that they only affect our pets in the warmer months. Just because we’ve entered into cooler weather does not mean that fleas and ticks aren’t still looking to attach themselves to your pet. These pests are still active in fall and even winter months. Since this time of the year is when most people like to spend more time outdoors with pets enjoying activities such as camping or hiking, checking for fleas and ticks frequently as well as continuing their prevention medications is a must. Another pest you have to be on the look out for are snakes. Fall is when snakes are preparing for hibernation. Check the areas where your pets often play and if you’re dog walking, stay clear of any tall grass that snakes might be hiding in. Along with all the fun activities fall offers, it also means that it’s time for children to return to school. Back to school shopping is always hectic, so the last thing you think about is your pets getting into the newly bought markers, crayons, glue sticks, pencils, and other school supplies. Certain types of markers and glue can be toxic to pets, not to mention the possibility of them choking on smaller objects. These supplies should be kept in places where your pets cannot get ahold of them such as in closets, cupboards, or a desk drawer. With the holidays that happen in the cooler months, there is never a shortage of decorations or food. It’s important to be mindful of what decorations and food are around your pets during this time to prevent them from harming themselves. Electrical cords that you may use to plug in lights could shock and damage your pets health if they try to chew on it so try to keep cords, lights, and ropes out of reach. Also, be aware of what food might be on your Thanksgiving table this season. Turkey bones and smaller foods can be choking hazards and beware of foods like chocolates, raisins, and grapes as they are toxic. Check with your veterinarian to see what foods are safe and what foods are off limits for your pets. Most people take cooler weather to start preparing for the upcoming winter months. This includes winterizing their cars by changing fluids such as antifreeze. The ingredient in antifreeze, ethylene glycol, is extremely toxic to pets. Just two teaspoons of this can kill a medium size dog. The substance has a sweet smell that pets are attracted to so that’s why it is so important to immediately clean up after you’ve changed the fluids in your vehicle. Try to keep pets away from the area altogether. While Fall is a wonderful time to be outside playing with your pets, be sure to keep these safety tips in mind. For more safety tips, contact your veterinarian to ensure the health and wellness of your pets.